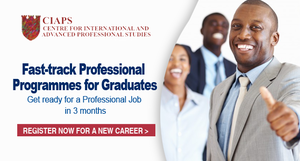 Lagos based International Graduate School CIAPS (The Centre for International Advanced and Professional Studies) has commenced registration for the April 2019 Special Professional Programmes for Graduates. The CIAPS Fast-track professional programme for graduates to commence on 27 April 2019. Graduates wishing to train for a professional career can now apply for these hands-on training programmes that offer opportunities for job placement and practical projects. Applicants for these courses are required to have a first degree or equivalent (Bachelors, HND). Having a good grade is a major advantage. Applicants without such qualifications may apply, but their applications will be subject to a more complex process and they will be required to demonstrate their ability to successfully follow the programme. In all cases, applicants will be tested by CIAPS through written assessments and verbal interview. You do not need to apply if you have applied in the past; just send an email asking for your application to be retrieved.